It does not take much effort to get noticed in the 2018 Toyota C-HR. Parked outside the Stouffville GO station on a weekday morning, I caught a shop owner peering out his window with an obvious “look at that!” expression on his face. A few other friendly folks who were impressed with the vehicle’s exterior walked right up to ask what it was. Yes, it appears Toyota has hit a homerun in the style department here. 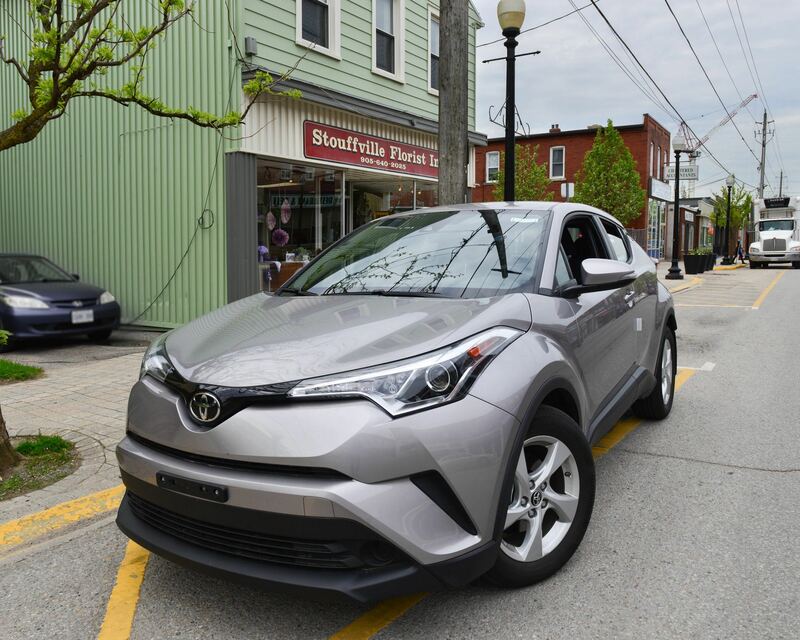 For those inquisitive minds, C-HR is an acronym for “Coupe-High Rider.” With a beltline that swoops up toward the rear of the vehicle, menacing body cladding and a taller ride height – the name certainly fits. One thing is for sure; Toyota is riding high on the excitement over its new compact crossover. The C-HR has a deceptively roomy cabin. Although it’s smaller in dimensions than the Rav4, you’ll find space for up to 5 adults. All of whom will be treated to an attractive diamond-themed interior. You will find that shape displayed in several controls, the door panels and even the headliner. It certainly adds an upscale feel to the vehicle. All the knobs and buttons are easily within reach, and I especially appreciated the backup camera display being in the rearview mirror rather than the infotainment screen. It’s just where my eye naturally goes when I pop it into reverse. Outside, the chiselled body, headlights and tail lamps give the C-HR a determined appearance. Like I mentioned earlier – you will get noticed. The C-HR gets its motivation from a 2.0L four-cylinder engine making 144hp and 139 lb-ft of torque. It’s mated to a continuously variable transmission that does a great job of keeping the driver in the power band. From short jaunts between stoplights to full-on freeway acceleration, you always feel like you have the power you need at hand. It also helps that Toyota tuned this vehicle’s suspension for a more adventurous driving style. There’s certainly no float to this high-rider. Turns can be taken crisply, and steering inputs through a winding stretch of road are just blissful. You realize how competitively priced the C-HR is when you consider that it comes standard with safety features including lane-departure alert, pre-collision braking and adaptive cruise control. The base model also gets you a must for our Canadian climate – dual-zone heated seats. You’d have to climb up a few trim levels to get the same from the competition. Adding the XLE Premium Package to your Toyota C-HR provides attractive 18-inch wheels, blind spot monitoring, folding power mirrors and push-button start. Call it added bling for your diamond-studded ride. 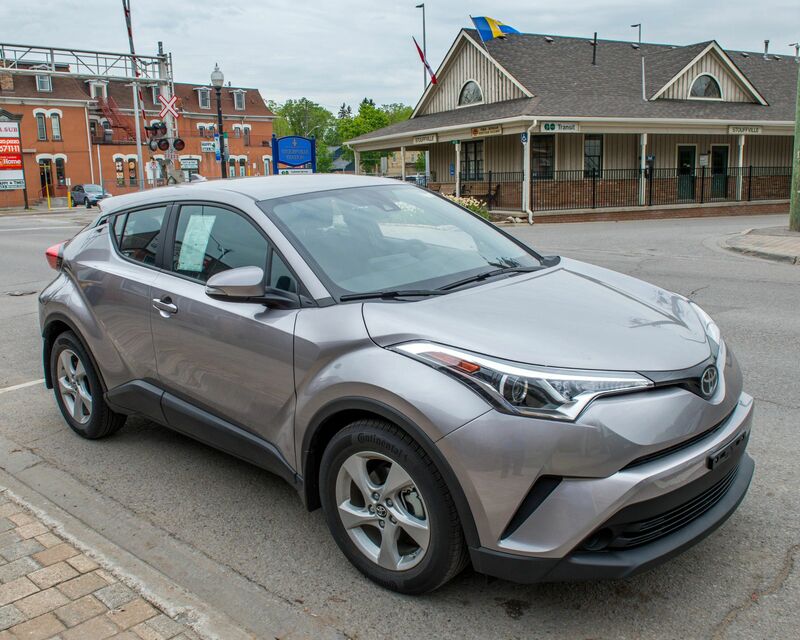 Taken as a package, the 2018 Toyota C-HR offers great drive-ability and superior safety features in a head-turning vehicle. Come have a look for yourself. It’s in our showroom – stealing the spotlight.